The New Martyr of Russia Alexander Hotovitzky was born on February 11, 1872 in the city of Kremenetz, into the pious family of Archpriest Alexander, who was Rector of the Volhynia Theological Seminary and would later be long remembered in the hearts of the Orthodox inhabitants of Volhynia as a good shepherd. Young Alexander received a good Christian upbringing from his parents, who instilled in him love for the Orthodox Church and for the people of God. The future pastor was educated at the Volhynia Seminary and the St Petersburg Theological Academy, from which he graduated with a Master’s degree in 1895. After graduation from the Academy, he was sent for missionary service to the Diocese of the Aleutians and North America, where he was assigned to the position of reader at the newly-established St Nicholas Orthodox Church in New York City. Following his marriage to Maria Scherbuhina, a graduate of the Pavlovsk Institute in St Petersburg, the Hieromartyr Alexander was ordained to the diaconate, and soon after, on February 25, 1896, to the priesthood by Bishop Nicholas (Ziorov) of the Aleutians, whom Father Alexander would always later remember with gratitude and love. A week after his ordination, the young priest returned to New York to assume the pastorate of the parish where he had previously served as reader. From 1898 to 1907, the New Martyr Alexander served as a pastor under the omophorion of Bishop Tikhon. Saint Tikhon, who, in the tragic year of 1917, was to be elevated by Divine Providence to the primatial see as Patriarch of Moscow, valued highly Father Alexander’s sincere piety, his gift of pastoral love, and his multifaceted theological erudition. The spectrum of his activity in the United States was quite broad and very fruitful. He was successful in missionary service, primarily among Uniates newly-emigrated from Galicia and Carpathian Rus. He was also one of the closest collaborators of the Orthodox archpastors in America and represented the Orthodox Church before American religious institutions and meetings. Through Father Alexander’s efforts, Orthodox parishes were established in Philadelphia, Yonkers, and Passaic as well as other large and small towns throughout North America. The parishioners of these churches were cradle Orthodox whom fate had brought to the New World, as well as Carpatho-Russians converted from the Unia and former Protestant converts to the Orthodox Church. An important contribution to the witness of the truth of Orthodoxy before heterodox American society was made by the American Orthodox Messenger, which was published in English and Russian under Father Alexander’s editorship. Articles by the editor regularly appeared in this journal. The New Martyr Alexander actively participated in the establishment of an Orthodox diocesan mutual aid society and at various times, he served as treasurer, first secretary, and president of this organization. The society provided material aid to Austrian Carpatho-Russians, Macedonian Slavs, Russian troops in Manchuria, and to Russian prisoners of war in Japanese camps. From 1914 to 1917, Father Alexander served as a priest in Helsinki, Finland, where the majority of the population was Protestant. Although Finland was then part of the Russian Empire, the Orthodox clergy there had to exert great efforts to protect the Orthodox Karelians from the proselytic expansionism of the Finnish Lutherans. In Finland, the New Martyr Alexander was a loyal, active, and dedicated assistant to his archpastor—Sergius (Stragorodsky), the future Patriarch. In August 1917, Archpriest Alexander was transferred to Moscow and assigned as assistant pastor of Christ the Savior Cathedral. Here he was again under the direct guidance of Saint Tikhon, with whom he had already been closely associated in America. 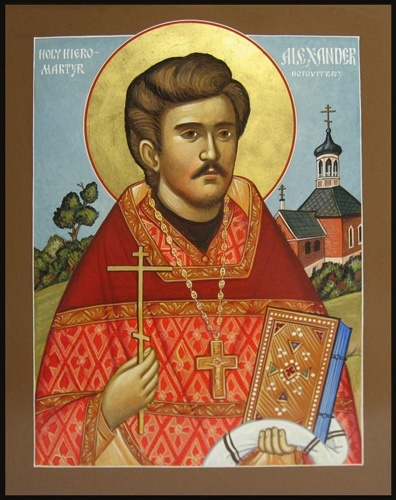 During the difficult years of the Civil War, the New Martyr Alexander collaborated closely with St. Tikhon in the administration of the Moscow diocese. In 1918, under the spiritual leadership of the rector, Father Nicholas Arseniev, and the assistant pastor, Father Alexander, a brotherhood affiliated with Christ the Savior Cathedral was established. As its first activity, the brotherhood issued an appeal to the Orthodox flock, which Father Alexander helped write. In response to this appeal, Orthodox inhabitants of Moscow joined the brotherhood of Christ the Savior Cathedral, and gave their alms to support the majestic church. Pastoral service at that time was accompanied by much grief and danger. In May 1920 and November 1921 Father Alexander was arrested for brief periods. He was accused of violating the decrees concerning the separation of the Church from the state, and the school from the Church, by holding church school for the children. In 1922, the Church was subjected to harsh tribulations when, under the pretext of helping the starving, ecclesiastical treasures including sacred vessels, icons, and other holy things were violently confiscated by the state. Heeding the appeal of Her holy primate, the Orthodox Church made generous donations to assist the starving. However, when Saint Tikhon issued a statement to his flock throughout Russia forbidding the cooperation of the clergy in surrendering sacred vessels for non-ecclesiastical use based on canon law, a slanderous campaign against the Church was begun in the press, Her primate was arrested, and a wave of court cases took place throughout Russia, in which servants of the Lord’s altar were accused of counter-revolutionary activity. During these trials many faithful servants of the Church of Christ were sentenced to death and shed their blood as hieromartyrs and martyrs. During this difficult time for the Church, Father Alexander was unwaveringly guided by the statements of the Holy Patriarch to his flock and also followed his directives. Funds to assist the starving were collected at Christ the Savior Cathedral. At the same time, measures were undertaken to protect the sacred objects of this church. Meetings of the clergy and parishioners of Christ the Savior Cathedral were held at Father Alexander’s apartment in order to draft a resolution of the general parish meeting concerning the state decree. A draft of the resolution, prepared by Father Alexander, protested against the violent confiscation of church valuables. A general meeting of parishioners was convened on March 23, 1922 at Christ the Savior Cathedral, presided by Archpriest Nicholas Arseniev. Father Alexander had already been arrested. This meeting adopted the final text of the resolution, which demanded guarantees from the state that all donations be used to save the lives of the starving. The participants in the meeting protest the poisonous publications against the Church as well as insults against the hierarchy. The drafting of this document was deemed by the authorities to be criminal counter-revolutionary activity. On trial in this case were 105 clergy and laity. Among the main defendants were Archpriest Sergius Uspensky, dean of the second district of forty churches in Prechistenka, Archpriest Nicholas Arseniev, dean of Christ the Savior Cathedral, Archpriest Alexander Hotovitzky, assistant pastor of this Cathedral, Ilya Gromoglasov, priest of Christ the Savior Cathedral, Lev Evgenievich Anohin, warden of this Cathedral, and Archpriest Simeon Golubev, rector of St John the Warrior Church. Following the interrogation of all the defendants and witnesses, at the Court session on December 6, the later infamous, sinister prosecutor Vishinsky delivered the concluding statement for the prosecution. He asked the court for a sentence of capital punishment for thirteen defendants including Archpriests Alexander Hotovitzky, Nicholas Arseniev, Sergius Uspensky, Priest Ilya Gromoglasov, Abbess Vera (Pobedinskaya) of the Novodevichy Women’s Monastery and L.E. Anohin. Vishinsky requested that the other defendants be sentenced to prison terms of varying length. On December 13, the verdict of the revolutionary tribunal was announced. It was milder than the bloodthirsty verdicts delivered at previous trials held in Petrograd and Moscow in conjunction with the confiscation of church valuables. Each of the main defendants—Abbess Vera (Pobedinskaya), Archpriest Sergius Uspensky, and Archpriest Alexander Hotovitzky were sentenced to ten years in prison, the confiscation of their personal property and the deprivation of their civil rights for five years. The others were sentenced to lesser terms of imprisonment. Appeals for pardon, made by those who were sentenced to the longest terms of imprisonment, including that of Archpriest Alexander, were rejected by the presidium of the Supreme Central Executive Committee on February 16, 1923. After the holy Patriarch Tikhon resumed his administration of the Church and made several statements regarding loyalty to the governmental authorities, many hierarchs, clergy, church leaders and laity, who had previously received sentences from the judiciary in conjunction with the confiscation of church valuables, were granted amnesty. Father Alexander was among those freed in October 1923. Following his liberation, he was not assigned to a parish but served by invitation at various churches in Moscow. By a decision of a special meeting of the administration of the Department of State Political Management, the New Martyr Alexander was exiled to the Turuhan region for a period of three years. His already failing health was further weakened by his sojourn in the far north. Following his return from exile, Father Alexander was raised to the rank of protopresbyter and became one of the closest assistants of the Deputy Locum Tenens of the Patriarchal Throne, Metropolitan (later Patriarch) Sergius, who knew him well since the time of his service in Finland. In the fall of 1937, the New Martyr Alexander was arrested again. The documentary evidence about him at our disposal ends with this; however, a majority of oral reports testify to his death as a martyr. The Orthodox Church in America, on whose territory Protopresbyter Alexander served as a priest until 1914, venerates him as a passion-bearer, whose life as a confessor ended with sufferings for Christ. The place of his burial is unknown. The Church of Russia also commemorates St Alexander on August 7, along with the Archpriests Alexei Vorobiev, Michael Plishevsky, John Voronets, the priests Demetrius Milovidov, and Peter Tokarev, the deacon Elisha Sholder, and Igumen Athanasius Egorov.